Firefighter Progressive Body Weight Workout. 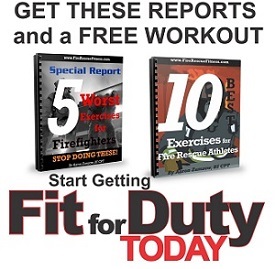 Join the FRF Nation and Get these FREE Reports and Workout. Just enter the information below. This website is about one thing...helping Firefighters get and stay fit for duty. 10 Simple Rules for Firefighter Fat Loss (2018 Edition). Firefighters–This Exercise will Reduce Injuries. Top Five Fitness Trends in the Fire Service for 2018. Get Your FREE Reports !